Paging doctor doctor, come save me because I’ve got a bad case of loving you. 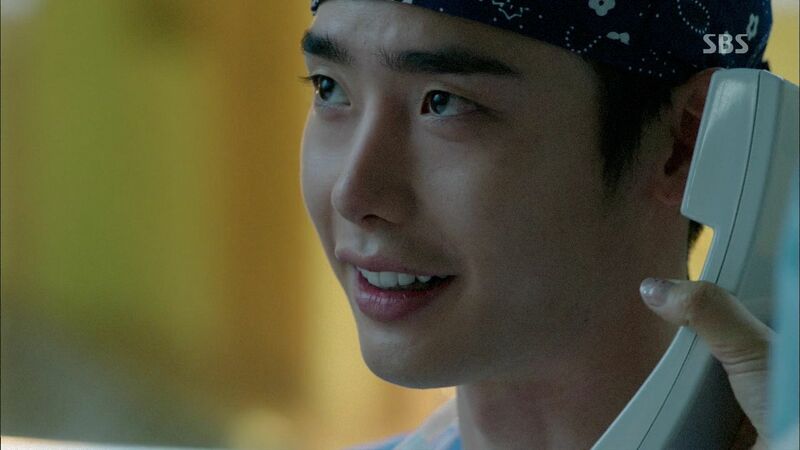 The more absurd Dr. Stranger gets, the more it works as Park Hoon anchors the five-ring circus in the warm embrace of his kind and caring arms. This drama can also be renamed parents-in-peril as we see a parental figure die or almost die in each episode so far. Jae Hee’s dad bites it in episode 1, Park Hoon’s pater dearest gets executed in episode 2, the little playground girl’s dad nearly dies of hospital incompetence before straight up medical ethics gets tossed out the window by Hoon to save him, and finally by episode 4 even Soo Hyun gets in on the cesspool of familial misery as it’s her mom’s turn to bite the dust. Judging by how Chang Yi’s just liberated from North Korea mom had a headache in the last episode and is checked into the hospital by this episode, chances are high that she’s going to need surgery soon that only the magic surgical genius hands of Park Hoon can save her. The improbable spy scenes have been replaced by improbable surgery scenes filmed with such free flowing energy it’s just fun to watch. Park Hoon goes from North Korean defector to having admitting privileges at Myung Woo Hospital in the blink of an eye, with barely anyone wondering WTF is happening other than Soo Hyun ineffectively raising an objection mostly because she can’t stand the guy. The drama continues to deliver the first love Song Jae Hee is also Seoul doctor Han Seung Hee reveal like a battering ram, this time showing evil North Korean Comrade Cha secretly in South Korea to meet with her. That’s just short of a neon flashing sign over her head flashing “I AM JAE HEE” for all to see. Hoon even finds the special Jae Hee braided bracelet on Soo Hyun’s mom’s wrist which nicely dovetails his first love search with Soo Hyun’s desire to save her mom. This drama is firing on all cylinders and it either works for you or it doesn’t. It’s working marvelously for me and I can’t get enough of Hoon being snarky with Soo Hyun and pining for Jae Hee all in the blink of an eye. 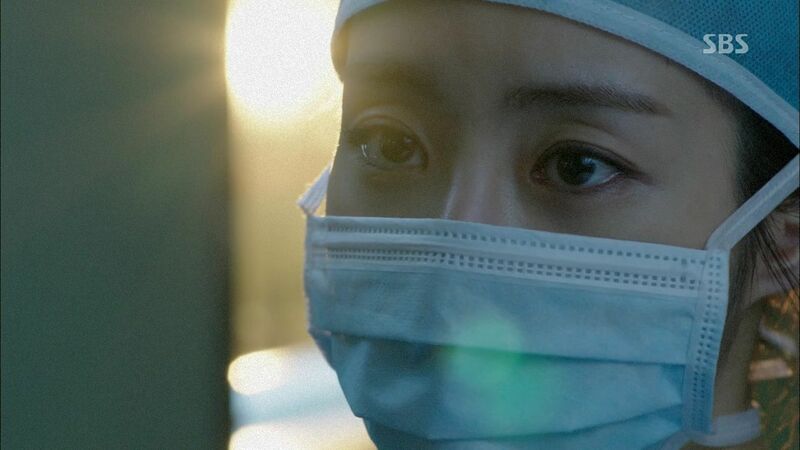 Playing fast and loose with medical logic and reality, this drama is clearly going to drive medical viewers nuts but for the casual drama fan it sure does pack a great emotional punch. 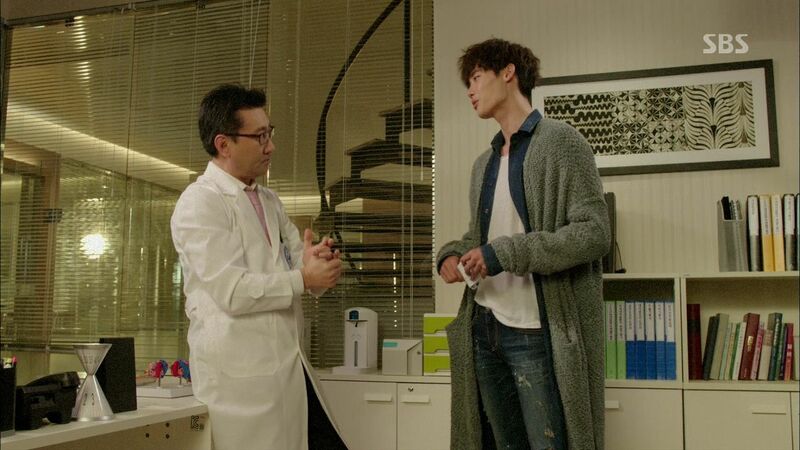 Park Hoon runs into the Jae Hee-lookalike Dr. Han Seung Hee at Myung Woo hospital. He chases after her as she buys two iced coffees and walks through the hospital. Dr. Han exits the hospital and gets into a waiting ambulance outside. The driver asks what took so long and Dr. Han explains she spent some time with the patient. The ambulance drives off right as Hoon runs outside and he just misses her. Hoon is certain that the girl is Jae Hee and takes off. Chang Yi and Dr. Moon run out behind him and continue following. Hoon goes to confront Mr. Lim about trying to swindle money from him when Jae Hee is already out of North Korea. He accuses him of doctoring the video of Jae Hee. Mr. Lim yells back that Hoon was mistaken and even he’s having a hard time finding Jae Hee now when he can make a call and find anyone. Hoon’s calmed down and listens to Mr. Lim rushing him to quickly earn the money needed to buy her freedom. He heard Jae Hee is being kept in a special detention center which is very scary so she needs to be extricated as soon as possible. Hoon asks how much and hears $50K US dollars. Hoon storms off when an unidentified man walks into the room and tosses a bundle of money at Mr. Lim and tells him that he did well. Oooh, so Mr. Lim is lying to Hoon! Mr. Lim takes the money and wants to ask if that girl is still in North Korea? The unseen man is willing to tell Mr. Lim but only if he wants to die. Mr. Lim swallows and looks away. 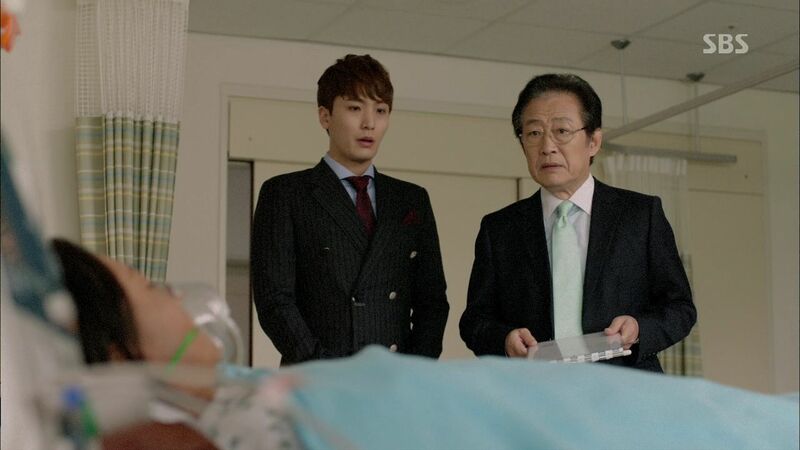 Hoon goes back to the little hospital where he finds Chang Yi and Dr. Moon waiting for him. Dr. Moon immediately talks money and is willing to pay for Hoon’s medical skills since he knows Hoon is saving up money to save his beloved. He finds it very romantic and lovely. Hoon kicks him out which is when Dr. Moon pulls out a wad of cash equal to $50K US dollars and waves it right in front of Hoon. He’s willing to hand it over if Hoon works for him at Myung Woo Hospital in the cardiothoracic surgery department. Jae Joon is angry at Soo Hyun for asking to transfer out of the cardiothoracic surgery department since she didn’t tell him beforehand. He wants to know why but Dr. Moon runs in without knocking and interrupts their conversation. They head to a meeting to vet candidates to bring in as new surgeons for the cardiothoracic surgery department. Dr. Han goes first and profiles a doctor from the US with sterling pedigree and recommendations. Dr. Moon raises his hand and wants to recommend a doctor of his own to recruit. His belief is practical surgical skill over pedigree. Dr. Moon plays the video of Park Hoon’s surgery for the little girl’s dad and everyone marvels at how good Park Hoon is. 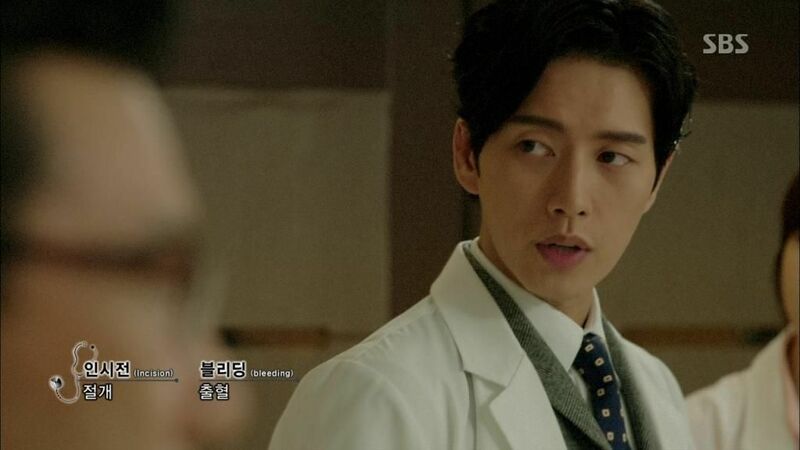 Jae Joon concurs and is happy to work with such a skilld doctor but wants to know more about who he is. Dr. 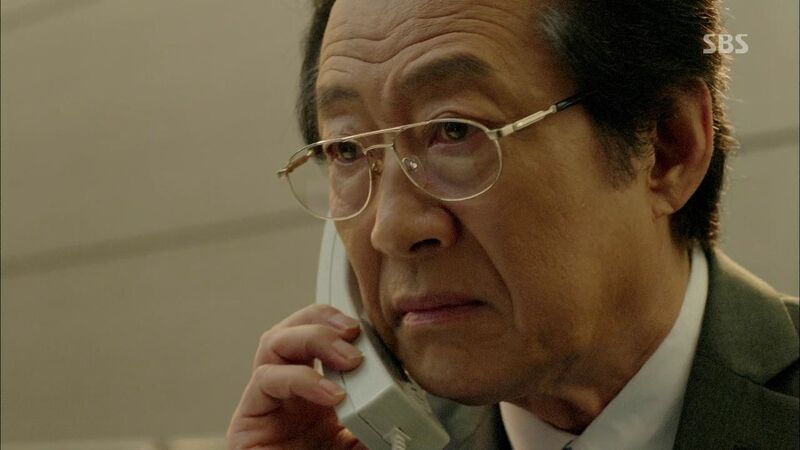 Moon didn’t come with a profile and just calls Dr. Park to come inside. 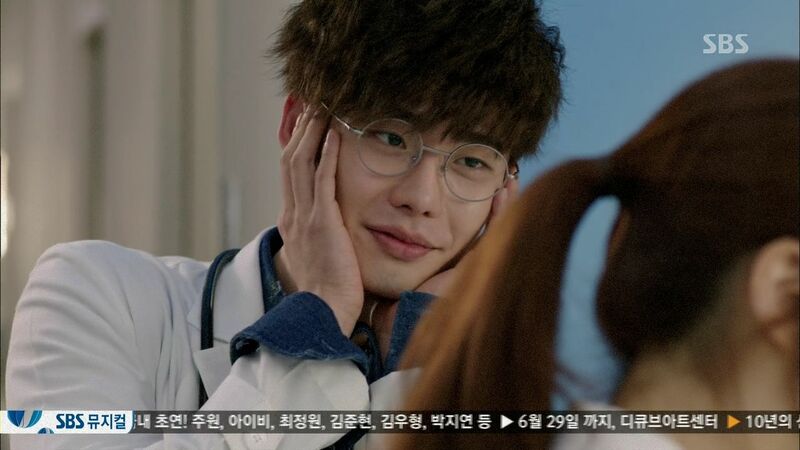 Park Hoon walks in and winks at Soo Hyun and bows to the gathered doctors. The former hospital president comes back and Chairman Oh greets him warmly. Conversation turns to the hospital looking to bring in new cardiothoracic surgeons and he appears to have an opinion on that. Jae Joon reminds Park Hoon that he didn’t want to see his face around here ever again and Hoon sighs that he has a good reason to be here. 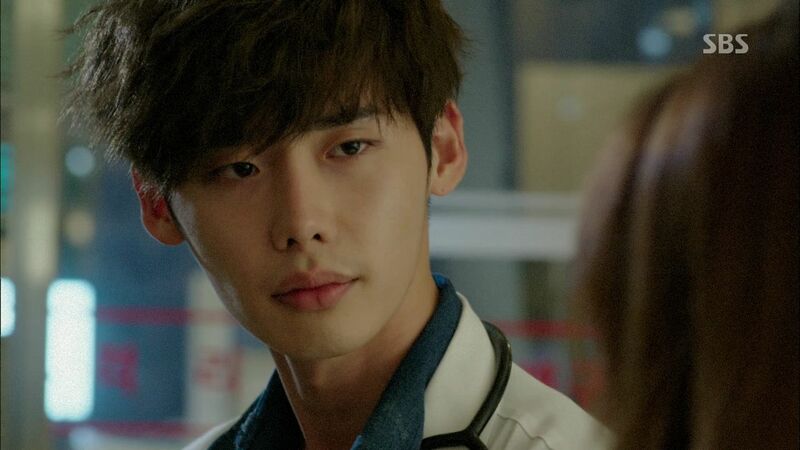 Another doctor wants to know which medical school Park Hoon graduated from but Dr. Moon interjects that education doesn’t matter and experience and ability is what matters most. Jae Joon presses for the medical school anyway and Hoon takes a deep breath before announcing that he graduated from Pyongyang Medical School. Everyone gasps and then files out grumbling about Hoon being from North Korea. Dr. Moon wants Jae Joon to accept that a North Korean doctor is still a doctor but Jae Joon points out that PM Jang’s heart surgery can’t be handed to a defector. Jae Joon leaves and Soo Hyun follows behind and exchanges a look with Hoon. Dr. Moon takes back the money from Hoon and grumbles about why Hoon didn’t reveal he’s from the North. He tosses a few small bills on the ground as payment for Hoon coming all this way with him and then derides Hoon for wanting to earn money to save the girl he loves. He thinks that’s just an excuse and really Hoon loves money. Hoon picks up the money and confronts Dr Moon, announcing that he loves and needs money so badly right now and what’s wrong with that? Hoon storms out of the room and finds Soo Hyun waiting for him outside. She tells him to go start a business if he needs to earn money so badly. Doesn’t he have a doctor’s pride? Hoon grabs her by collar and points out that wearing a white doctor doesn’t equal having self-respect. He keeps calling Soo Hyun a useless doctor and that pisses her off. Hoon goes to the cafeteria and sees a female doctor buying a cup of coffee which reminds him of seeing the Jae Hee-lookalike there. Chang Yi comes with a pair of athletic shoes as a birthday present for him and he tosses it aside. She gets down to pick it up and Hoon turns back and takes it from her and puts it on with a smile which makes Chang Yi happy. Dr. Moon is having a hissy fit in his office when he’s called to a meeting with Chairman Oh and Dr. Han. 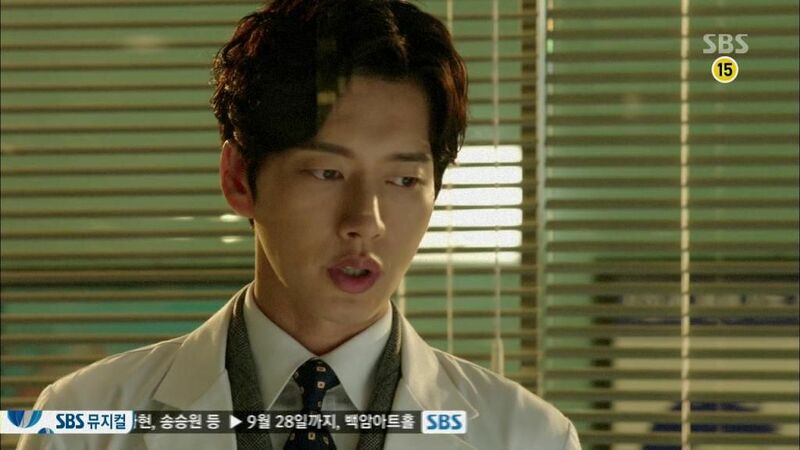 Chairman Oh is impressed with Park Hoon’s ability and asks if Dr. Han is willing to take him into his team? If not then how about Dr. Moon? He suggests the two surgeons form teams to compete for the right to do PM Jang’s heart surgery. The winning team gets a reward and the losing team will be punished. Dr. Moon leaves the meeting and is wondering what to do when the former hospital president walks over to greet him. Hoon and Chang Yi put her mom to rest in a hospital room at Myung Woo but she wants to transfer her mom back to their little hospital. Hoon wants her to stay put here and even took out the deposit on their hospital to pay her bills here. Chang Yi doesn’t want to use the money on her mom since he is saving it to save Jae Hee. Hoon knows Chang Yi needs it more urgently now and wants her to let him do this. Dr. Moon walks up to them and pulls Hoon aside to flash all the money before him again. Hoon wonders why the sudden change of mind? Turns out Dr. 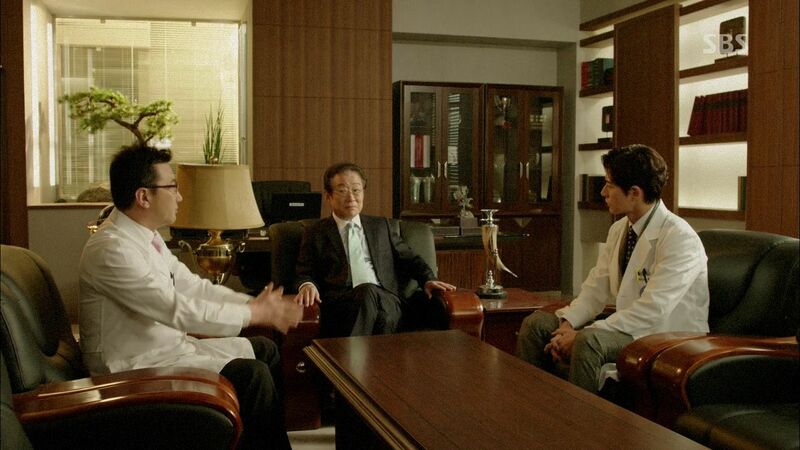 Moon heard that PM Jang owes a debt to Park Hoon so the former hospital president urges Dr. Moon to work with Park Hoon. Money convinces Hoon to accept but he wonders what he’ll be doing here? Dr. Moon wants Park Hoon to prepare for a big battle with Jae Joon coming up. Jae Joon is getting all the young doctors together for a dinner and when talk turns to inviting Dr. Yang. Jae Joon picks up the knight figure and smirks before suggesting Dr. Yang is busy. 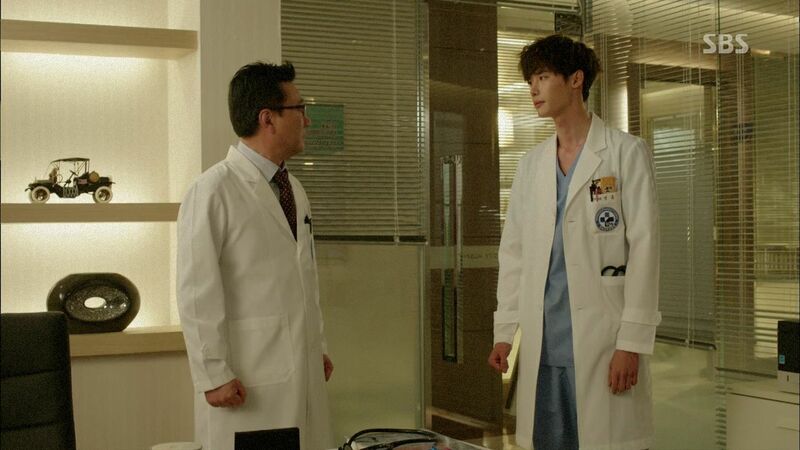 Dr Moon brings Dr. Yang to meet Park Hoon but finds Hoon’s new office empty. Hoon’s run off to hand over the payment to Mr. Choi but then he tears the money orders in half and will only hand it over when Jae Hee is out of North Korea and he has proof. 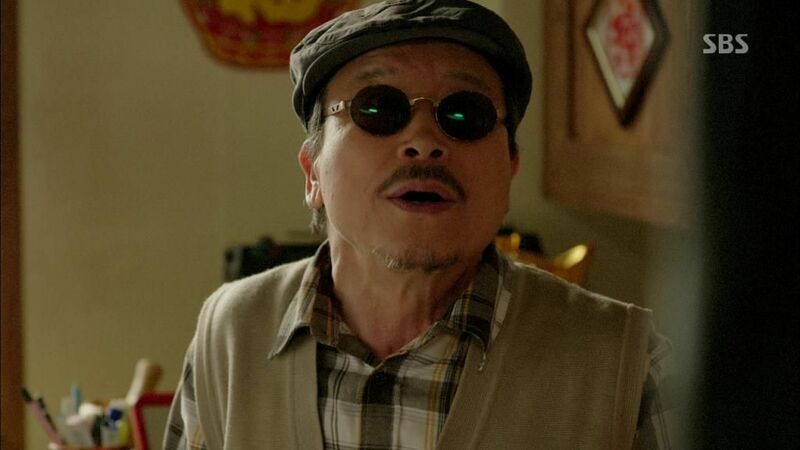 Chairman Oh is informed by his useless son Sang Jin that Soo Hyun’s birth mother is in the hospital. He doesn’t look happy and asks if Soo Hyun knows yet? Soo Hyun is headed for her rounds when she runs into Hoon at the nurses station. She demands to know why he’s here and he sasses back that the big boss approved it. Hoon calls from his cell to the land line right next to Soo Hyun and tells her “useless doctor, answer it” when it rings. Soo Hyun actually picks it up which makes all the nurses giggle. Hoon puts his hands on his cheeks to preemptively protect himself from Soo Hyun slapping him and walks up to her with a smile. He asks if her hands itch now and she smiles back and says her legs itch before kicking Hoon right in the groin. 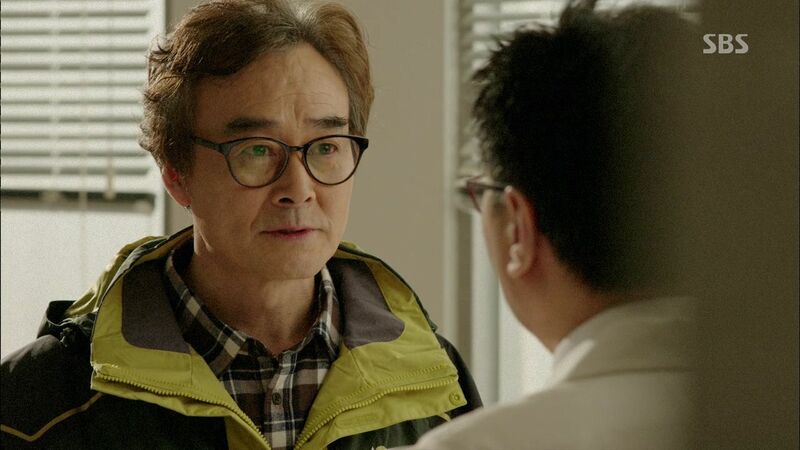 Chairman Oh has Jae Joon analyze Soo Hyun’s mom’s medical condition and he concludes that her heart is failing with a high risk of bleeding out during surgery. Soo Hyun tries to ask her dad to reconsider hiring Park Hoon but he’s made up his mind and she wisely knows when to stop. Sang Jin walks into his dad’s office and is happy to see Soo Hyun there. He drags her to see her mom laying in the hospital room and calls it his present. Sang Jin happily wants to know if she’s all sad because her mom had late stage lung cancer with only one week to live. Soo Hyun acts nonchalant and says her mom is lunching with friends right now and Sang Jin yells back that she’s his mom! Soo Hyun refuses to acknowledge her birth mom and give Sang Jin the satisfaction of seeing her sad. Soo Hyun walks over to the nurses station and asks when the patient was admitted and hears she came in this morning. Park Hoon asks if Soo Hyun is the legal guardian of that patient because she has a DNR request attached to her file. It’s from a long time ago so if Soo Hyun is the legal guardian she can change it now. Soo Hyun says no need and walks off. Soo Hyun watches a nurse tend to her birth mom and hears she’s been unconscious this entire time. She wants the nurse to wake her up because she has something to ask her. Flashback to Soo Hyun when she took art lessons from her mom. She waits for her mom after class and begs her mom to take her back so they can live together again. She graduated from university and has her doctor’s license now so she wants to live with her mom again because it’s too tiring to live in that house. Her mom coldly tells her to go back and the exhaustion will pass soon. Soo Hyun is in a daze during the doctor dinner organized by Jae Joon. He gets up for a friendly greeting to the entire table and asks that they become one big family at work. Soo Hyun is so out of it she has to be reminded to join the toast. Jae Joon can tell her mind is elsewhere. Soo Hyun checks her phone and looks alarmed. Soo Hyun’s mom is coding and Park Hoon runs into her hospital room to find all the nurses standing around not saving her because of the DNR. Hoon immediately starts resuscitation procedures and manages to bring back Soo Hyun’s mom. Soo Hyun leaves the dinner immediately and goes back to the hospital. Jae Joon tries to ask her what’s going on but she doesn’t say anything other than she needs to go somewhere. Soo Hyun gets into the elevator in the hospital and remembers happier days when she was a little girl with her mom. 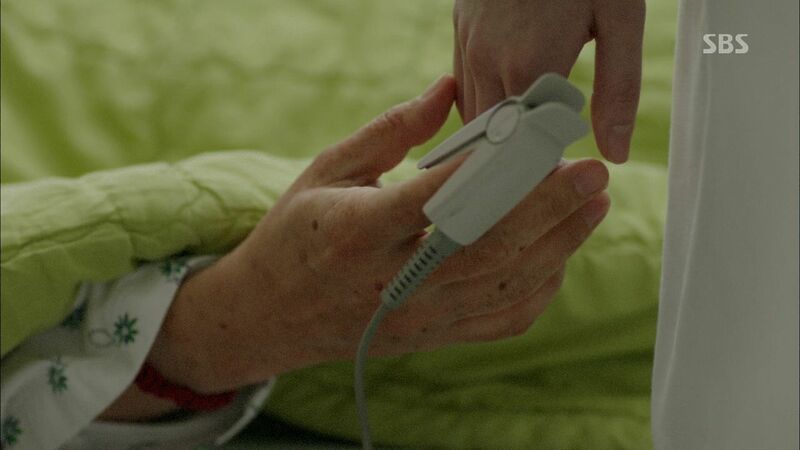 She walks into the hospital room and finds her mom is still alive and in stable condition. She looks relieved and angry at the same time. Hoon arrives to check on the patient and Soo Hyun drags him aside to chew him out for not abiding by the DNR request. The patient wants to die because she doesn’t want to endure the pain of late stage cancer. Hoon says if the patient wants to die then he couldn’t resuscitate her but he brought her back because she doesn’t want to die yet. Soo Hyun storms out and Hoon tries to ask a nurse what Soo Hyun’s relationship with this patient is? Hoon goes back to check on Soo Hyun’s mom and finds Jae Hee’s bracelet tied around her wrist. 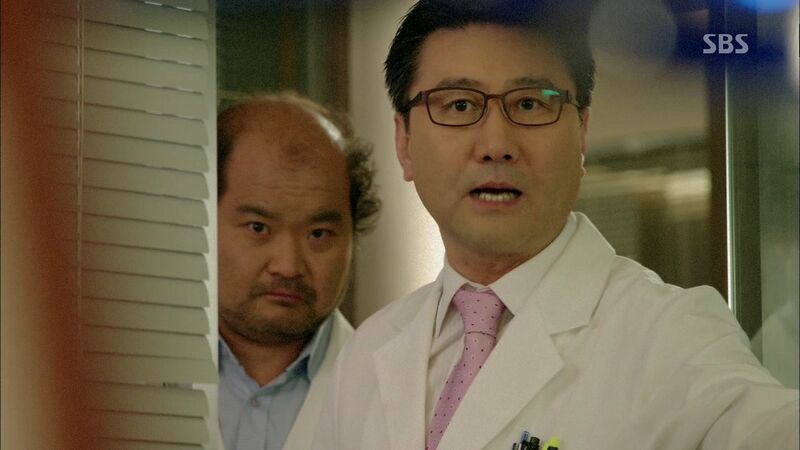 He grabs the patient’s file and sees the signature of a Dr. Han Seung Hee who transferred her over. He calls that hospital and Dr. Han answers the phone so he hears her voice. She then hands the phone off to a nurse and heads to the ER. Hoon finds out from the nurse that the patient doesn’t have family and arrived at the hospital alone but also didn’t have any accessories on her like a braided bracelet. Dr. Han walks outside and meets with a black-clad Comrade Cha who gets out of a car to meet her. 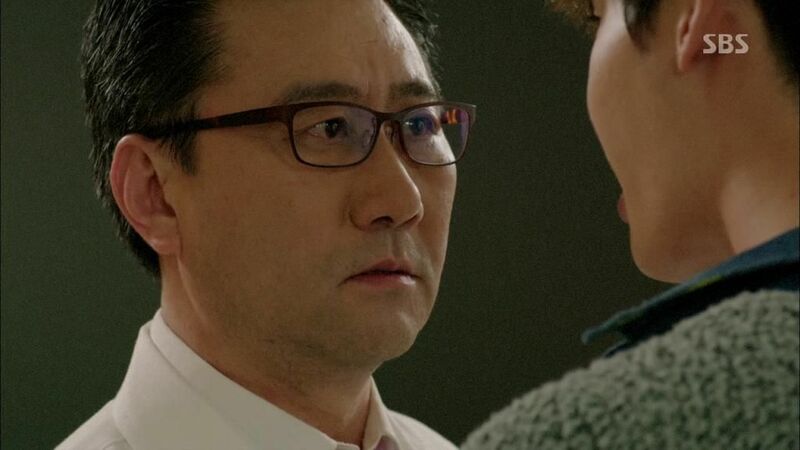 Mr. Lim is spying on Comrade Cha and is shocked to see him meeting with the Jae Hee-lookalike. PM Jang is having a dinner with other politicians and media when he’s called aside by Secretary Kim to brief him about the current investigation into his election funds. PM Jang tears up the investigation update and sneers at the attempt to bring him down. Secretary Kim arrives to meet with the investigators and is surrounded by media asking him about the investigation. He says there was no impropriety with the election funds and the PM will cooperate with the investigation fully. Dr. 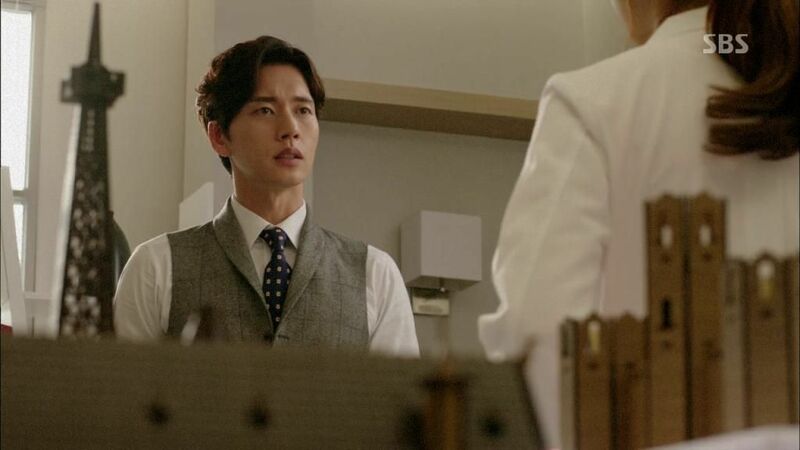 Moon angrily pulls Park Hoon aside to demand why he’s doing a surgery for a woman who is about to die. Hoon has to save her because he needs to ask that patient something. He leaves Dr. Moon sputtering about Hoon never listening to him. Soo Hyun is standing by her mom’s beside when Jae Joon walks over and says this patient can’t be saved because the surgery is too difficult and high risk. Soo Hyun still wants him to operate on her and reveals that this patient is her birth mom. Hoon stares at Soo Hyun’s mom’s chest x-ray and then starts performing the surgery in his mind. He fails the first time as he bursts an artery and angrily re-starts the simulation again. Soo Hyun asks Chairman Oh about her mom, he wants to keep her alive for the week she has left. Soo Hyun has the opposite idea, she wants to end her mom’s pain and be the who sends her mom off. She goes back to her mom’s beside and remembers when her mom coldly gave her up to go live with her dad Chairman Oh. Little Soo Hyun cries because she wants her mom but her mom slaps her hand away and tells her to leave and never come back! Soo Hyun turns off her mom’s monitor and takes off her mom’s ventilator. She is about to leave when her mom’s hand moves and grabs her hand. She looks back and her mom’s eyes open and she smiles at Soo Hyun who cries and calls her mom. Jae Joon asks Chairman Oh for permission to operate on Soo Hyun’s mom but he refuses. If the patient dies on the operating table then it’s a embarrassment to the doctor and right now he’s in a competition with Dr. Moon. 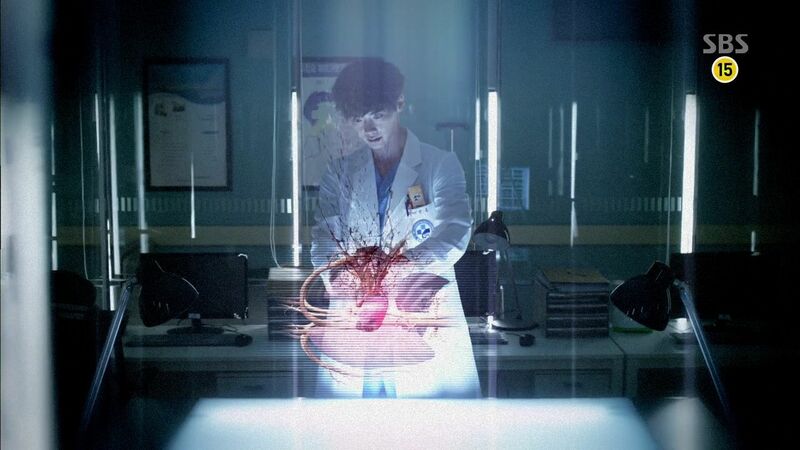 Hoon continues with his operation simulation but this time the heart codes. 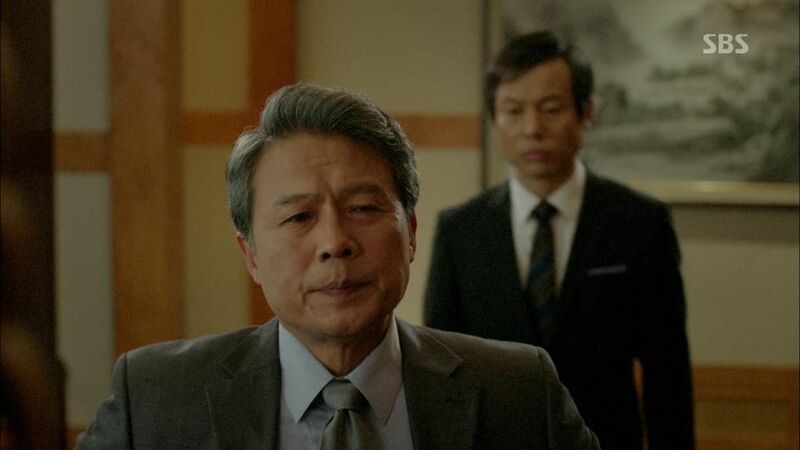 Jae Joon leaves Chairman Oh’s office without getting permission to operate on Soo Hyun’s mom. He sees her calling him but purposely doesn’t answer his phone. Soo Hyun doesn’t know what to do when she finds Park Hoon’s 500 won coin in her white coat pocket. Hoon is resting on the table after all the surgery simulations and remembers Jae Hee falling off the bridge in Budapest. He wakes up despondent and exhausted. Soo Hyun walks in and he doesn’t have energy to talk with her. Soo Hyun wants him to operate on the patient but Hoon says it can’t be done. The risk is too high and even if the surgery is a success the patient will be left in severe pain. He wanted to operate on her because he had something to ask her but it can’t be done. Even someone like Hoon can’t do it. Soo Hyun cries that he told her he could do it so he has to keep that promise! She takes out the coin and puts it in his hand, begging him to operate and she will do whatever he asks of her. Hoon asks who the patient is and Soo Hyun reveals the patient is her mom and she wants to ask her mom something. Soo Hyun begs Hoon to save her mom. Chairman Oh arrives at the OR viewing room as the prep is underway for Soo Hyun’s mom’s operation. 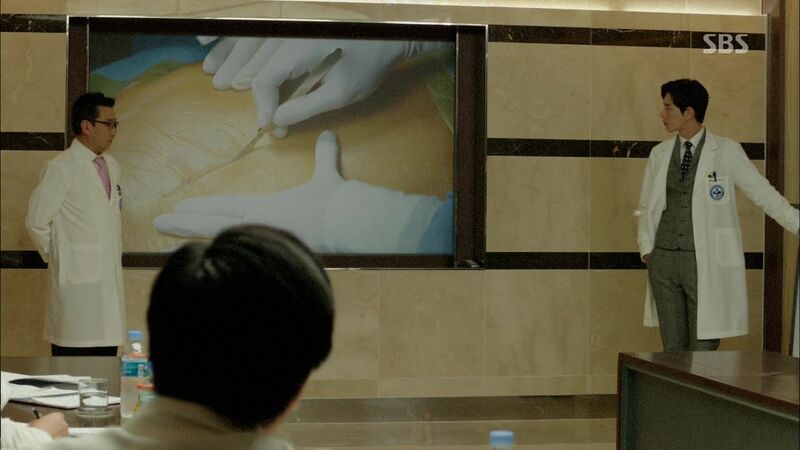 He calls down to the OR and tells Soo Hyun this is pointless. He even told Dr. Han not to do the surgery and Soo Hyun says she wants to try and found another surgeon to do it. 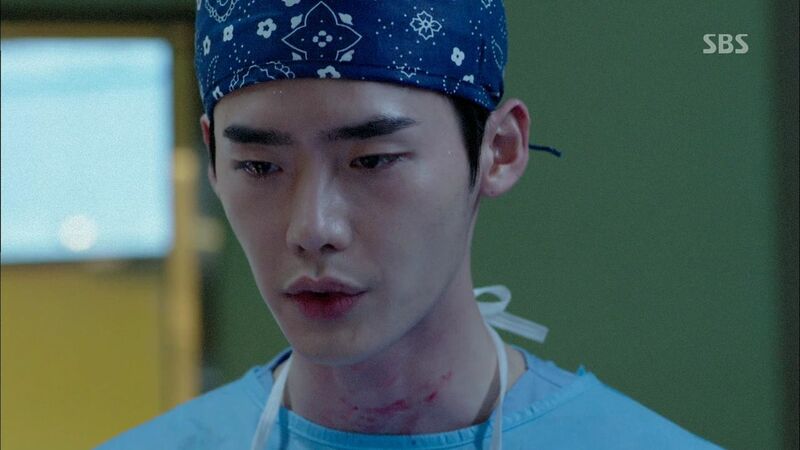 Chairman Oh asks to talk with Park Hoon and orders him to stop the surgery. Hoon says he got family permission to do it and Chairman Oh yells back that he’s also family! Soo Hyun reveals the man on the phone is the chairman of this hospital and if Hoon does this surgery then he will be kicked out afterwards. Hoon pauses before telling Chairman Oh that he will do the surgery because he accepted payment already. Chairman Oh storms out of the viewing room and runs into Dr. Moon coming in. Dr. Moon chases after the Chairman to assure him that he told Park Hoon explicitly not to operate on that patient. Chairman Oh glares at him before going back to his office. Jae Joon arrives at the viewing room and exchanges a look with Soo Hyun below. The operation starts with Jae Joon and Dr. Moon watching from the viewing room and Chairman Oh watching on video feed back in his office. 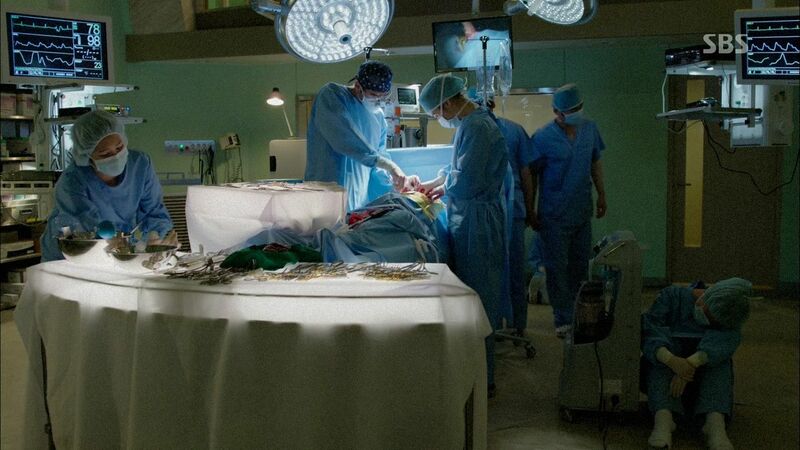 The operation goes on so long that many of the doctors in the OR are slumped over in exhaustion. Suddenly a vessel burst like it did during Hoon’s simulation and he immediately tries to resuscitate the patient but to no avail. 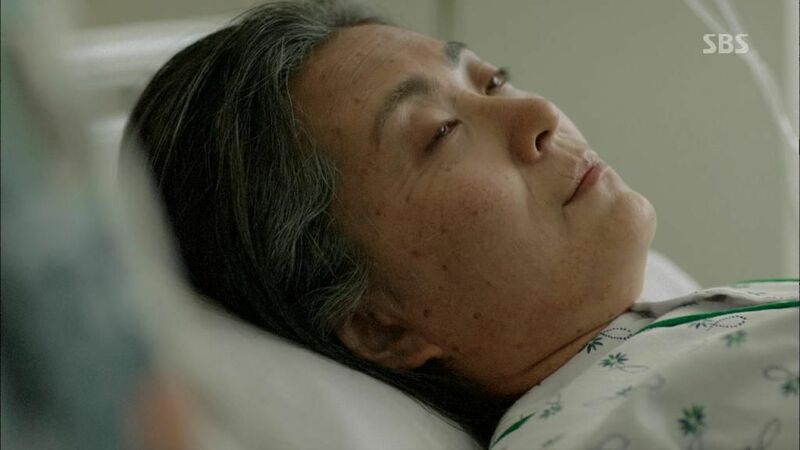 Soo Hyun’s mom dies on the operating table like Hoon predicted. Hoon stops resuscitation and Soo Hyun’s mom flat lines. Soo Hyun yells at why Hoon is stopping when he hasn’t restarted the heart yet. Hoon thanks everyone present in the OR for their hard work and tells them to leave now and he’ll clean up. Soo Hyun tries to restart the heart herself but Hoon says it’s over and apologizes to her. Hoon asksher to stop while she continues massaging the heart and muttering about the things she still wants to say to her mom. Soo Hyun finally stops and starts sobbing as she asks why her mom left her like this? Hoon pulls the sheet off Soo Hyun’s mom and officially announces time of death. Soo Hyun starts struggling with him until he pulls her in for a comforting embrace. He keeps apologizing and repeating that she’s gone, tears falling down his face as well because he’s been right where she is right now. Soo Hyun cries and finally embraces Hoon back. Which is when Jae Joon walks into the OR and finds the two of them hugging. His face hardens imperceptibly and oh lord is the rivalry on big time. Can I first ask the comments section to cut it out with the unending “Jin Se Yeon is sooo horrible, why isn’t Kang Sora the female lead” comments. It’s a broken record by now so either watch and have a substantive comment on the story or check out of this show. I don’t care much for Jin Se Yeon myself but find she’s serviceable enough here and the rest is buoyed by how much I like Jae Hee as a character and how much I love her love story with Hoon. The same thing happened with her in Age of Feeling, I loved her way more than the female lead in that drama because she had the better character and was easier to watch onscreen. She’s kinda like a blank slate, she works if I like her character and she falters when she is asked to make an annoying character likable. Normally I need lots of exposition and romance build-up to really buy into the central romance but DS has managed to masterfully sell me on Hoon-Jae Hee without needing to pile on the fanservice scenes between. 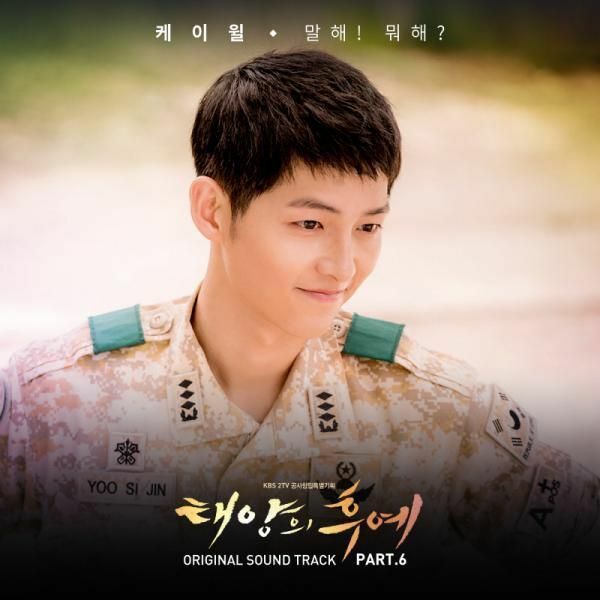 It’s mainly due to Hoon’s meaty character set up, the fact that he’s been torn from South Korea to grow up in the North, how he has nothing to dream about other than a future with Jae Hee, and now she’s all that he has left in his floating life with could easily be cut loose but for his sole connection to her. She is literally his only hope to keep on living and that is just the stuff to build drama romance dreams on. I can see that he’ll also grow more into his role as a doctor, saving lives when no one else can and generally fulfilling the destiny his father passed on to him. To say Hoon is the ultimate male lead package is putting a lot of faith on his shoulders but so far he’s everything I want in my tortured heroes and then some. Soo Hyun got her episode to shine and boy did she step up to the plate. I love Kang Sora’s acting for Soo Hyun, a combination of prickly and vulnerable but mostly just a long simmering desire to find solace somewhere. Too bad for Jae Joon to have her find genuine support and comfort in Hoon’s arm and not his arms. 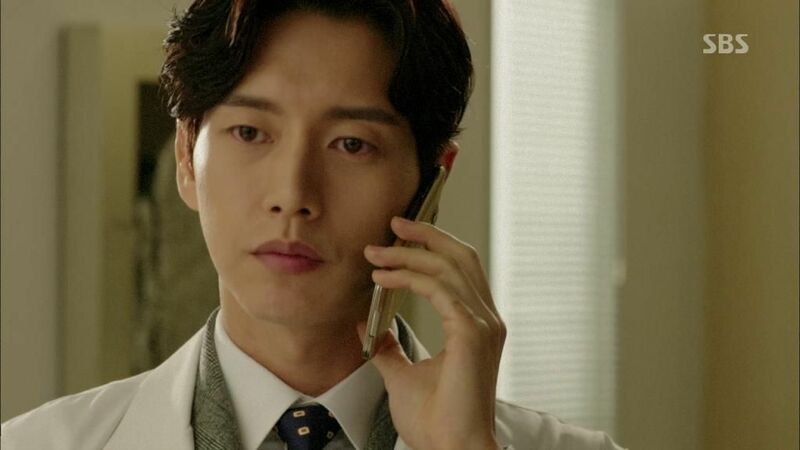 Jae Joon as a character only works because he’s played by Park Hae Jin, all gorgeous in suits and calculating under the devastating eye stares. I’m willing to give him time to show me his layers when I’d have written him off as destined to always be one step behind Hoon. Jae Hee is similarly underdeveloped but she feels more alive because of how she’s living and breathing in Hoon’s fantasies and memories all the time. THAT is how important she is to him, how anyone can ship Hoon with Soo Hyun boggles the mind. Unless the real Jae Hee is dead, hell will freeze over before Hoon will fall for another woman. I love that Soo Hyun is affected by Hoon and find their chemistry adorable and super fun. But flirting and having stirrings of the heart is one thing, Hoon and Jae Hee have the kind of epic star-crossed love that is destined for happiness that defies all odds or epic flame out of the both dies in each other’s arms variety. Hoon falling for Soo Hyun is about as likely as Dr. Moon revealing himself to be a North Korean crack spy master stationed in a Myung Woo hospital all this time. I loved every moment of this episode, from the Dr. 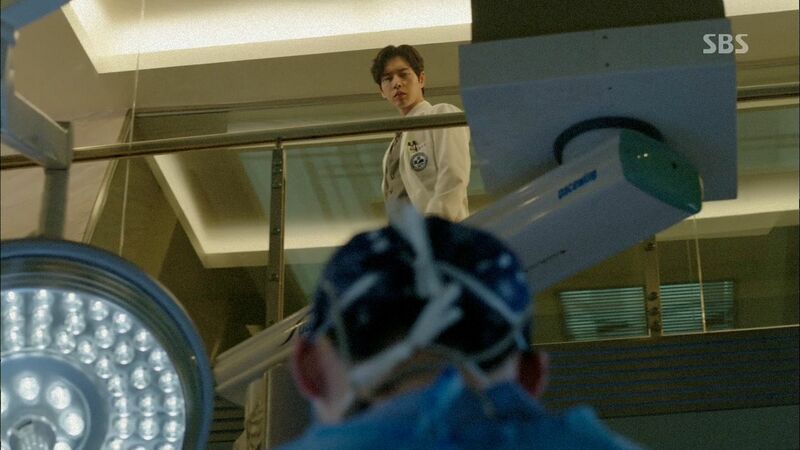 Moon ridiculousness that he would find some random surgeon to bring into the hospital to Hoon once again exhibiting genius surgical abilities such as conjuring up mental simulations in his brain, all the way to poor Soo Hyun’s mom needing to go to the Heaven for Dr. Stranger Parents just so her character can crack the tough angry facade and reveal the sad little girl underneath. Bonus points for Hoon once again being there for her when Jae Joon wasn’t. I can’t quite figure out how Jae Joon and Soo Hyun got together, is he using her to get closer to Chairman Oh or is there genuine feelings for each other underneath their professional scrubs at work? The kiss in episode 3 now feels like out-of-the-blue fanservice since there hasn’t been any additional signs of romantic attachment between them, but that could be how they interact as the less affectionate type. On the other hand Jae Hee and Hoon give viewers cavities but I can’t get enough of their sweetness. The drama continues to bop along nicely and I’m looking forward to Jae Joon and Hoon fighting over more than top dog status as surgeon of the century at the hospital. So far Hoon’s PWNing Jae Joon in every department from being a good supporting shoulder for Soo Hyun to rely on and for stepping up to his medical responsibilities. Now all I need is for Jae Hee/Seung Hee is get integrated into the crazy loony toons world of Myung Woo hospital and watch the fireworks fly. yay!!! thanks koala! off to read! love this drama to bits! Anyways, these are my hypotheses so far. I’m enjoying this drama so much that I am actually more invested to it compared to YAS amidst my humongous love for LSG & CSW. Well, it’s still too early to tell but yeah, so excied for next ep! Come on show, give me some preview!!! Nope, after seeing episode 4 I feel like she is luring park hoon for some reason. (the bracelet, n how she stopped when she walked to the ambulance with the coffe at her hand n also when she checked on the rear mirror of the ambulance watching Hoon from it with a lil smirk on her face) All of those adding with her meeting with the comrade. To all that I don’t really feel JaeHee chemistry, idk why…. after captured, almost died on operating table coz of damaged kidney, n fell down the bridge thingie. she suddenly in a special camp that for somereason she got filmed in by calling hoon name? too fishy for me lol. so yep I feel the same with you… either that is the real jaehee is a spy, or someone that looks like her (plastic surgery or something)that was planted there to capture hoon back. Either way… I rather see hoon with dr. Oh haha :P, well that’s my opinion anyway. Hello koala 🙂 My first time comment on your beautiful blog & recap bc this drama took my urges to comment. Yes I’m completely agree with you esp with a part where anyone ship Hoon x Soo Hyun. I can see that Soo Hyun finds a comfort in Hoon, but Hoon for suddenly developing romance to Soo Hyun is like throwing the first two episode out of window where we can see how much he devoted for his first love & so much out of character for him to do that. thanks Ms. Koala for your recap! it’s amazing how uninterested i was at first with this drama b/c i wasn’t fond of the actors playing the main leads, but once i started watching, whoa, i was sucked in immediately and i can’t let go. I find myself rooting for the male lead to reach his goal of finding his first love and to fulfill his dad’s request to not forget about being a doctor. Although some parts are unrealistic, it’s not jarring for me b/c i’m greatly entertained by everything this drama is giving me. Thank you again for your recaps and i look forward to your future recaps of this drama! Here’s my theory about the whole Jae Hee thing. I think North Korea saved her and brought her back to North Korea. They made her get amnesia in order to cultivate her into the perfect weapon, without the baggage of her past. When they felt she was ready, they sent her to South Korea as a doctor. Her purpose there is to spy on South Korea. Remember how evil comrade leader guy HAAAAATES Hoon to the core? Jae Hee is also their to satisfy his thirst for revenge. What better revenge than to make Jae Hee kill Hoon? The woman whose mere possibility of existence that drives Hoon to continue living is also the woman who would take his life. Even if he did find out about the scheming, he could never kill the love of his life to save himself. Omgomgomgomgomg. Please be a happy ending. My heart can’t take anything less than that. I can totally see that. Like maybe they brainwashed her using the info that Hoon killed her dad and then sent her as a spy. However, there was no reason to think Hoon would ever see SH’s omma wearing the bracelet, so I doubt that was part of the plan. koala sis, thanks for the recaps! usually, when i watch a drama and most of the time, the plausible is shown, i tend to take it as that, so i just enjoy the drama, like i am doing now and Hoon is such a nice character to behold. koala sis, thanks for the recaps. i don’t care how impossible the plot of the drama when everything else is going great, and so far DS is going almost perfect on that tone. 🙂 i am so loving hoon. Thanks for being Hoon-Jae Hee/Seung Hee shipper. It will be out of Hoon character to fall for So Hyun. 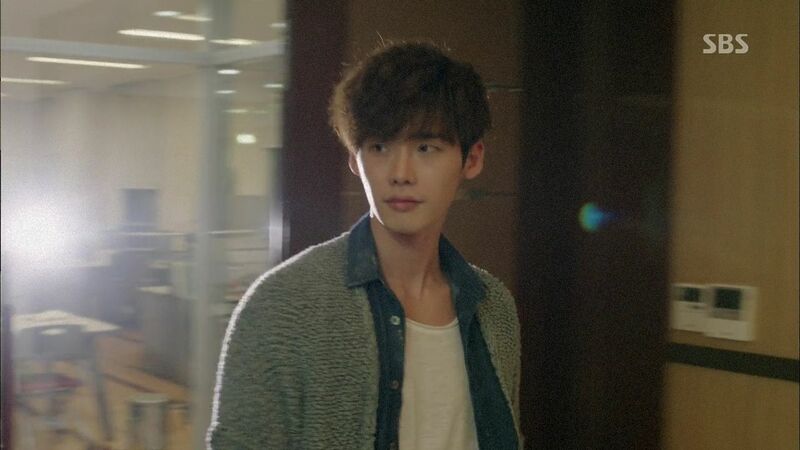 However I feel no surprise at all So Hyun fell in love with Park Hoon. This drama clearly show us it about Park Hoon journey to become great doctor at the same time willing do anything to be with his destiny Song Jae Hee together. It will a lot of internal and external obstacle coming for them before being together finally. 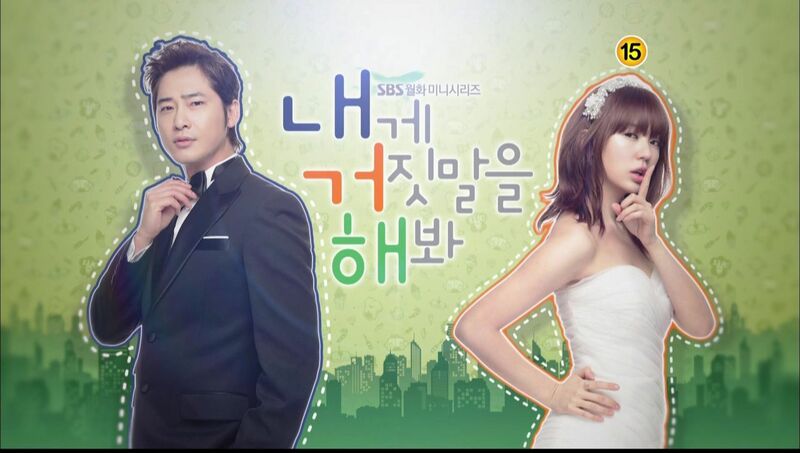 I love So Hyun but I want to understand the character of Jae Hee. Please please where is she???? 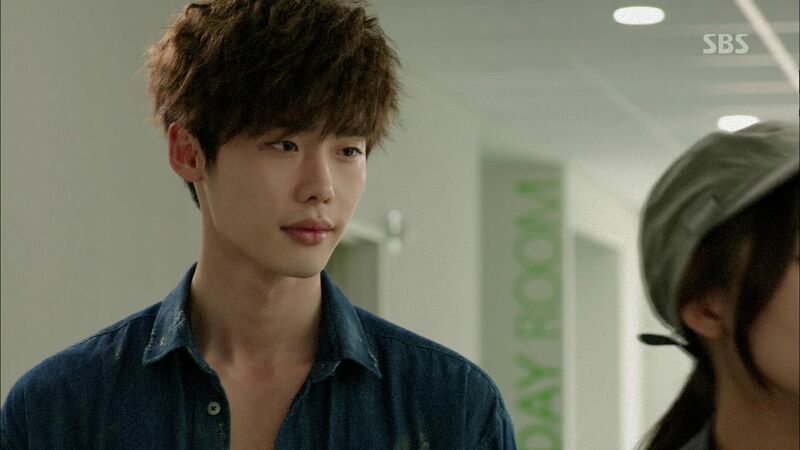 Well Koala, JSY acting is good and all, but it isn’t the viewers’ fault Kang Sora has more chemistry with LJS than JSY. JSY chemistry with ther co-actors depends so much of the actor, she does have a cute chemistry with LJS though. It is the same feeling you feel for Jung so min and KJW against leading lady LDH. 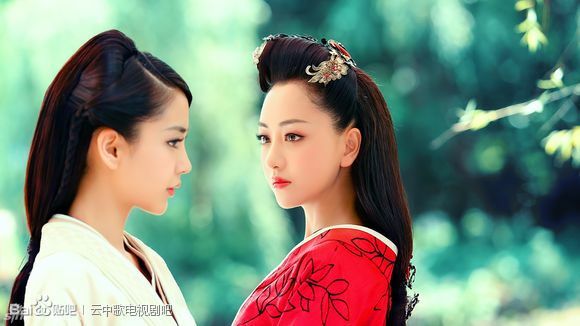 The main actress character is boring and second girl comes and steals the scene…. The plot is so full of possibilities I’m having a hard time sleeping. I thing JH knows who Hoon is. There is the scene where she watches him from the side rear view mirror with a knowing look and also the scene where she picks up the phone, hears his voice and hands it to a nurse. The question is how did she become a doc? Was she always a doc in training like Hoon? How was she able to become one in just 2 years otherwise? The gaps in timeline makes things confusing. What if she was always a spy? But then there would be no happy ending as everything is then a lie. In the earlier episodes, I think it was either ep 1 or 2, they indicated thst Jae Hee went to the same medical school as Park Hoon. She must have trained as an anesthesiologist there before she was imprisoned. Okay I watched ep 4 raw this morning because I absolutely had to hear him say his medical school scene. I had fits laughing at the whole ridiculous scene. I am not on either or against the 2 actresses camp. I just want to comment that JH was more organic in the earlier episodes. But was played so woodenly in this episode. Will you all think about how you react with your colleagues in real life? Did you see the blank expressionless face when she was in the ambulance? And when they pulled away? That was just plain unnatural. If you had just given someone coffee and driving away with another person- who just sit blankly? Unless the writer has written it that she had amnesia post almost drowning and is now a well trained N Korean drone? The medical scenes are laughable but if I ignore it the pace is zooming along. And that makes for such entertainment. How strange that the last 2 dramas that worked for me are all technically train wrecks plot-wise but so zippy and interesting. 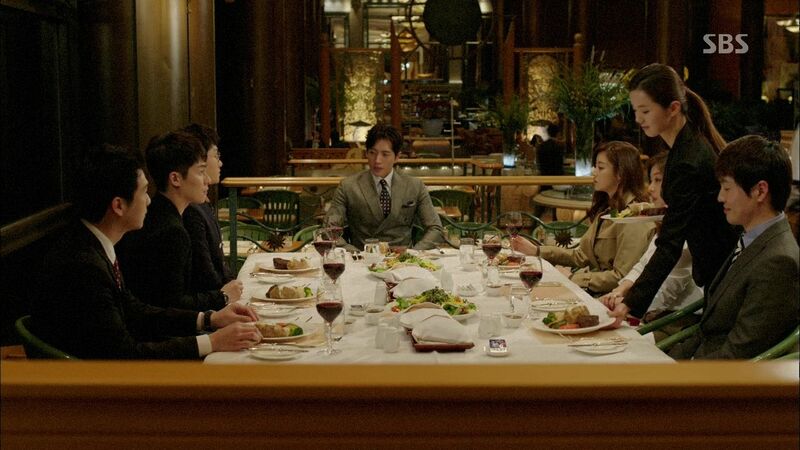 I am talking Bride of the Century. I guess actors expressions are open to interpretation, but I never felt Jae Hee’s expressions were blank. She looked like someone who knows that she was a bait and being followed, and I got the feeling she really didn’t like doing what she was doing at that moment. (Of someone reluctantly doing an unpleasant task). Her behavior was more mysterious than anything else and arouses curiosity in me as a viewer. Is she a reluctant participant being blackmailed or threatened to keep Park Hoon interested in joining the hospital? Did she leave the bracelet on the ajumma’s hand as a sort of warning or message to Park Hoon? All these questions keep me entertained and thoroughly vested in upcoming episodes. I’m less invested in So Hyun, as I see the embrace as more comfort/friendship than anything else. @ck10z sweety do you expect her to give a v sign after handling the coffe?at this time she is still supposed to be a mysterious character so expect her to be stoic,unresponsive..when she was looking at park hoon in rearview mirror she is either saying heyy hoon ah glad to see you or hows your health. I am talking about her expression to the ambulance driver.There are no interactions with Hoon at that point. And when she is looking straight ahead zoned out. If I am riding on a work assignment for work most people I know don’t look expressionless. That scene and the hospital canteen scenes expressions are not comments in relation to Hoon. @ck10z ah ok..so your talking about the ambulance scene.and your reference is you yourself on how you interact with your coworkers but are you a spy or somekind of a mysterious person.? Oh I just love jae hee and park hoon …made for each other…please let them be together again. me too im into the love of park hoon and jae hee…i agree with you koala the hell will freezzz first before park hoon will fall in love with another woman..the last two ep the drama showed the back story of dr.oh hopefully in next ep is about dr.han..and btw my new fav character is dr moon he is funny without trying to be funny and he loves nice/good love story..thank you koala for your recaps.. So we have all the initial baddies of SK and NK both out to get Hoon, the SK lot want him to operate on the PM (keep tabs on him, so they can either use or get rid of him when needs be, stop him from finding out they murder his mum, and left him and his dad to died in NK all for the sake of their own glory), while the NK want him back in their midst as he is an exceptionally gifted Doctor! both Hoon and Soo Hyun will be friends that will rely on each other for support through the crazy world they are living in as well as the hospital shenanigans. Jae Joon, is very career hungry motivated man, I don’t think he cures with his heart only with his head and what is best for him careerwise no blots on his CV,he is cold and calculating character, who is always after being praised! whereas Hoon cures with his heart and gut instinct, he is genuine in wanting to help others not to show off or further his status as a Dr.
That’s my feeling as well. Kang Sora is good, but so far her acting leaves me cold. Jong Suk on the other hand brought lots of tears to my eyes. I feel the same way Lee Jong Suk is so good he can make me cry with! The scene with his dad and Jae Hee left me a blubbering mess. 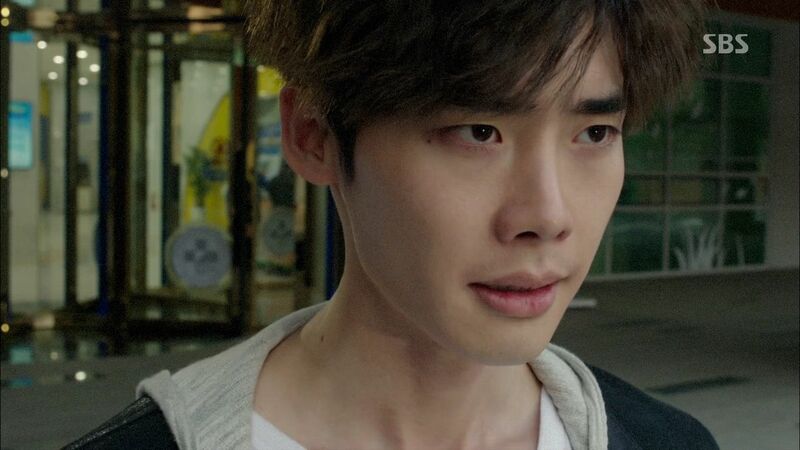 Lee Jong Suk is such a superb actor …. 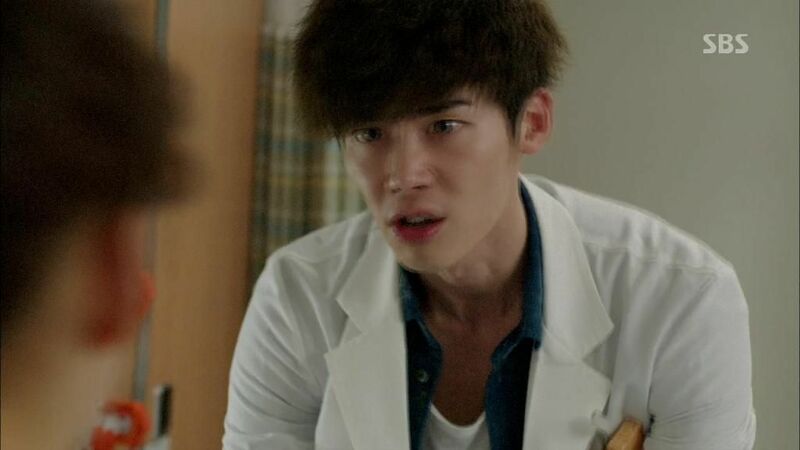 he nailed his portrayal of Dr. Park Hoon excellently ..I think Jae Hee was brainwashed and don’t even know who she really is ..therefore she might have forgotten who is Park Hoon and her mind is only full with the instructions from NK’s authority to spy on Park Hoon and bring him back to NK. for me , I am rooting for PH to end up with JH of course.. JH is his first love that he loves deeply that he would do anything just to find and be with her .. I don’t think that he would fall for Soo Hyun but then SH might fall in love with PH seeing how caring and warm PH is beneath his cool appearance. what does ms koala mean by “Hoon falling for Soo Hyun is about as likely as Dr. 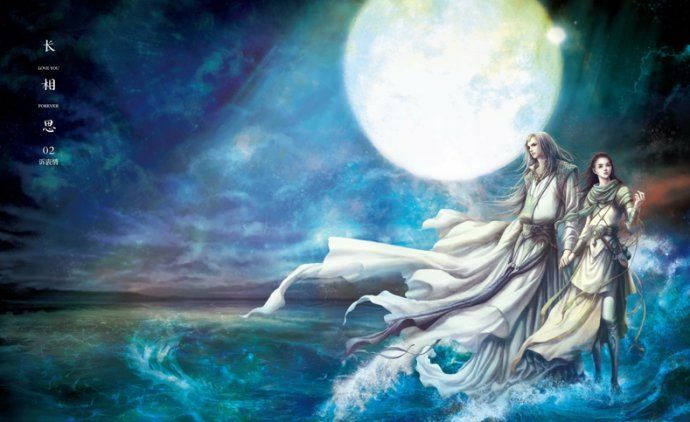 Moon revealing himself to be a North Korean crack spy master stationed in a Myung Woo hospital all this time.” Ö Dr Moon is from North Korea? lol..i think what miss koala is saying is something that it will never happen.its not in the plot/story. I think that is truly Jae Hee. But after being rescued, she found out that Hoon was the one who killed her father (by transplanting his heart into hers). So now she is sent to South Korea to be a spy and take revenge. Or she simply couldn’t take the torture anymore and decided to work as a spy to get away with it all. I think she was brainwashed by NK. Like, you know – if you read mockingjay, it’s the same how peeta react to katniss after brainwashed by capitol. Love to hate. Friend to enemy. I don’t think it IS Jae Hee – at least not the real one. And it was a kidney, not a heart. 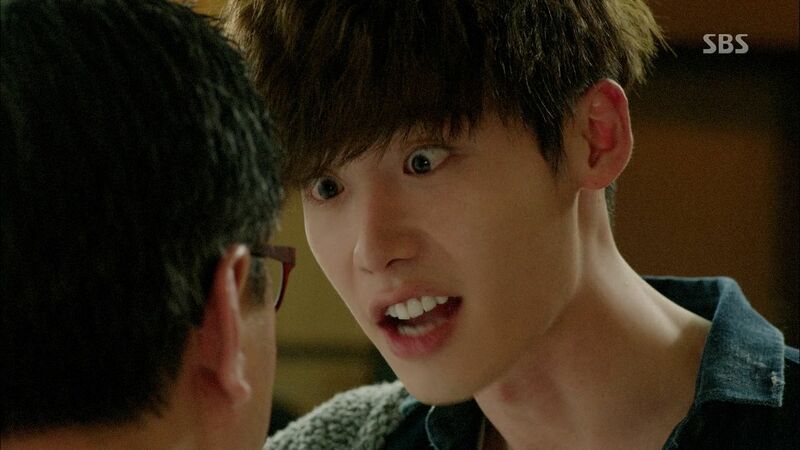 Oh miss Koala, this is the best recap of Doctor Stranger so far!!! If the story makes Hoon loves Soo Hyun.. it will just… eh? Then what’s the point of Hoon’s character existence? It will just pointless for sure! Okay to be more substantive: I’m all in for a double spy Jae hee. Just imagine the angst when both seung hee and hoon finally meets but SH does her best pretending. And yes, I do believe that she’s also employed by nightshade. Without talking the actor/actress that play the character, only by the character, I, truly wish that Jae Hee is really dead, dead, I mean this time, really dead. And Seung Hee is just an evil agent sent by North, because right now I am shipping Park Hoon and Soo Hyun so hard I can’t even contain my bursting feels and it hurts. I mean.. 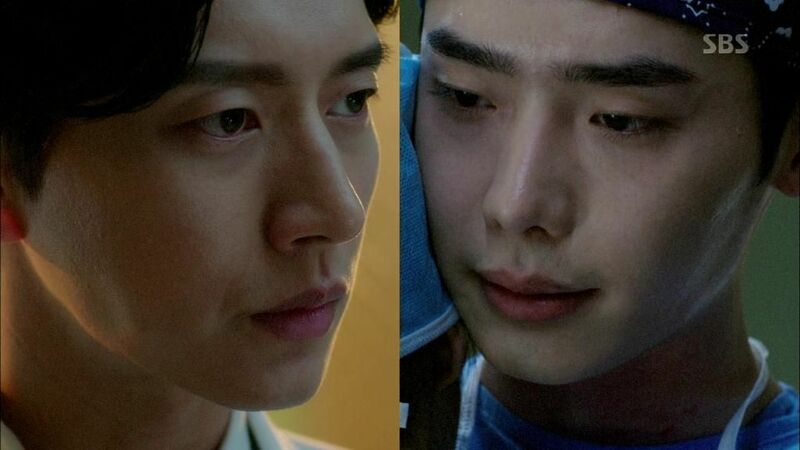 I understand how important Jae Hee is, Park Hoon had made it clear and obvious. But Soo Hyun. She just feels right. I like how the the build up of their relationship more. The background of their relationship and how they interact. That’s what missing from Park Hoon and Jae Hee as for me. And also, can’t this be the first drama (at least the one among which I’ve watched) where the Main Guy end up with the Second Lead. And to add more, can’t this one be different? We have to many first love, being with the same girl, searching, sacrificing everything, and in the end getting that one girl from the past. How about change in the wind? This time, it’s about letting go and moving on. Or how cute Lee Jong Seok and how awesome Kang Sora is. Jae Hee probably is really dead. Or alive and not so well in a DPRK gulag. Or a North Korean spy in South Korea. Or all of the above. appletea… there is a drama where the main guy end up with the second lead. It’s called Two Weeks. Also, how is a show about “letting go and moving on” different from cliche romantic comedies? Where the second lead is the first love or former girl friend? How can one say that Hoon should move on? When they did not get by separated by choice but someone else’s politic ambition. 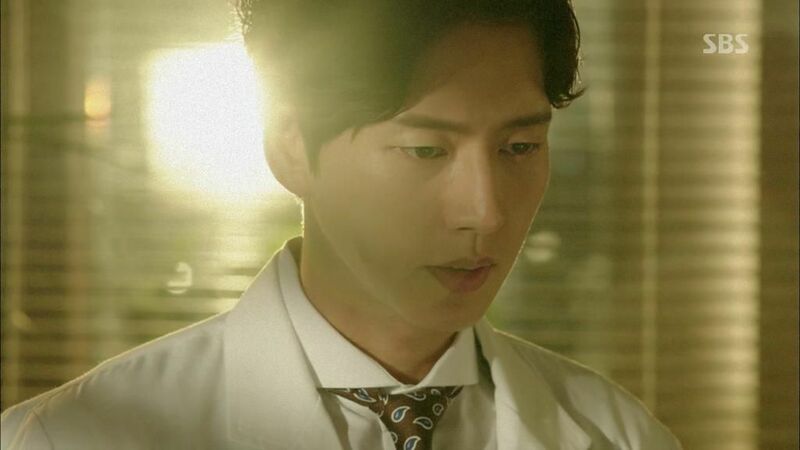 But afterall, if it’ll be end with jae hee – hoon, or hoon – dr.Oh, it’s still okay for me. Yeah, it is almost like Jae Hee (in one clone or another) is really just a plot prop here, and really does not do much – kind of a minor character that Genius Doctor is totally obsessed with. This is one of the most WTF insanely written dramas I have seen for ages, and perhaps that is what makes it work. *NOTHING* makes any sense, so I can totally suspend any feelings of logic and minor crap like.. real facts and stuff. And I am still trying to figure out what Useless Son’s role is, except to be utterly worthless. It is almost like he is proud of being a total parasite. And just ONCE, can we have a bad guy in a k-drama that does not have the black jacket and baseball cap? KANG SORA&LJS are the one i rooting for to end up. their onscreen together is smoking hot. if pd want better rating. 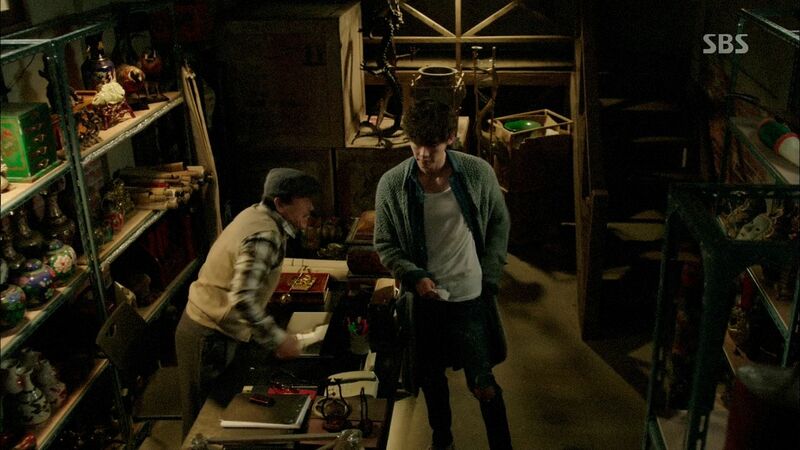 he better get these two more screen time together. kang sora acting has improve so much. still remeber how akwrad&stff her acting was in dream high 2. JSY will nevr have good onscreen cuz of her akward&stiff acting. she only good for one thing and that looking good for the camera. Aww, Koala, probably my favorite thing about your blog is that when you fall for a drama, you fall hard~ your adorable fangirling over a drama really enhances our viewing pleasure. Thank you! These bibimbap dramas sure are tasty! Btw, Kang Sora’s character can’t end up with Park Hoon because the character is very similar to the one she played in Ugly Alert, which means she and Im Joo Hwan must still be living HEA and she can’t possibly be with anyone else! They made an awesome OTP that no other drama should tear asunder. u never know how a good rating will do. if KANG SORA&LJS keep having high rating when they togeter. PD might have a change of heart and make them end up together. Dont get it why kang sora fans have to badmouthing jsy, if ur idol really good in everything theres no need to be sarcastic about other actress just because jsy factly more good looking than sora doesnt mean she should get bash. Even though im not jsy fans, i just feel like vomit everytime i see unmature comment about pretty face actress but baselessly hater say have no good acting skill. i also agree with ms. Koala, about hoon jaehee love story, its just remind me of moon that embrace the sun, kim so hyun character was very similar with hoon character in term of their devotion towards their true love. I just hope that ksr fans wouldnt get a badly heartaches when hoon and jaehee being together, and ksr probably will have abetter ending than the queen character in moon sun, i dont really favorite another suicide by hanging in atree ar probably jumping from the highest floor in the hospital, but well if its happen ksr will for greater good can show us her awesome acting skill on how one should do it when they are falling and about to die, sure it kind of enjoyable for me and fun to watch her show off to all of her bosting fans about her well deserve oscar acting ability, lol. 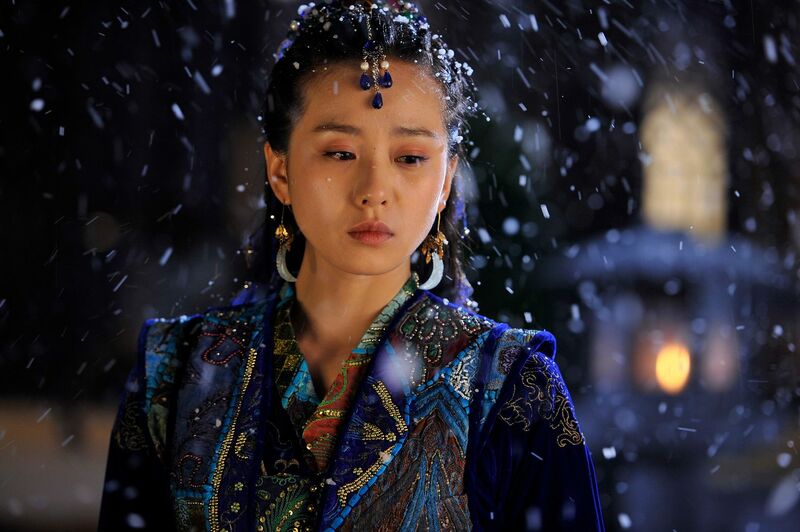 lol ksr fans are desperately praising her acting like tomorrow is the last day on earth.is it because she hit the car wd a bricks,slap ph face and kick his balls.the crying scene at the last part it was ljs commanding voice that made that scene very dramatic i love how ljs acted the scene.the best comparison is the coin between ksr and the kid kim ji young.kim ji young did so very well that it made me cry but not with ksr. lol do u really cant tell who better actress between kang sora&JSY? kang sora can show more emotion then JSY will ever do. all JSY good for is looking pretty. for your info i not even a kang sora fan. i just find her acting better then JSY. I’m a sucker for star crossed lovers but again I just want a bickering coworkers fall in love. It’s indeed a tough choice. I like JH with short hair better. She’s pretty. As far as Hoonah and Quack. They could end up being super duper really good supportive friends. It doesn’t have to be lovey dovey.